February 3, 2017 – Jaguar Land Rover North America, LLC announced today that the company has hired 100 veterans in eight months since launching the Jaguar Land Rover Veterans Careers Program, which connects skilled and experienced Transitioning Service Members and Veterans with positions across the Jaguar Land Rover retail network. 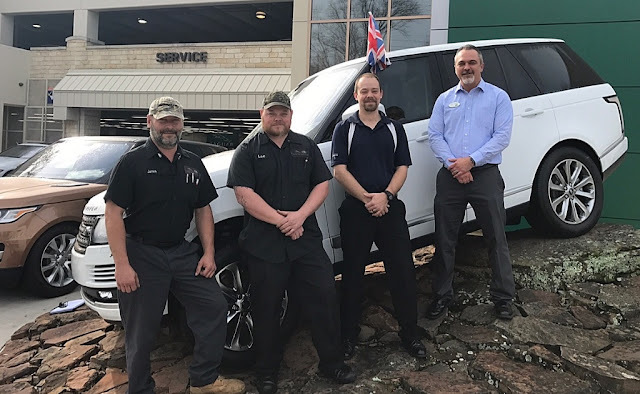 Jonathan Irby (second from right), a former Navy Petty Officer and F/A-18 Super Hornet jet aircraft mechanic, is the 100th Veteran placed through the initiative, joining the team at Jaguar Land Rover in Austin, Texas. The hiring of Veterans across the American retail network serves as an extension of the British automaker’s global commitment to supporting those with military service backgrounds. Jaguar Land Rover will also return as the 2017 presenting partner of the Invictus Games in Toronto, Canada - the international sporting event for Wounded, Ill and Injured Service Members, taking place from Sept. 24-30, 2017. Since 2014, both Jaguar Land Rover, and its wider supply chain, have benefited immensely from the recruitment of highly skilled Transitioning Service Members, Veterans and Wounded, Ill and Injured talent. The luxury automaker has employed more than 200 Veterans in the UK since 2014, far exceeding its original commitment under the Armed Forces Covenant.